Average Height	: 9" - 19"
Average Weight	: 6 - 40 lbs. The American Eskimo is one of the Spitz families of Nordic breeds. It is closely related to the white German Spitz. German Spitzes were eventually brought to America, where the name changed to American Eskimo Dog due to the widespread anti-German feelings during World War I. The Samoyed, the white Keeshond the white Pomeranian and the white Italian Spitz are also said to be related to the American Eskimo Dog. Evidence suggests that "White Spitz" dogs were first brought to the United States by German settlers and despite the name, have nothing to do with the Eskimo culture. The name came about in 1913 when Mr. and Mrs. F.M. Hall first registered the breed with the UKC (United Kennel Club). 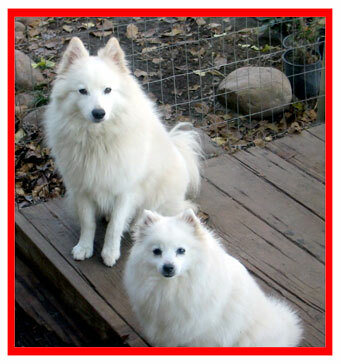 Their kennel name was "American Eskimo," which became the name of the breed. In 1969 the National American Eskimo Dog Association was formed and the studbooks were closed. The American Eskimo Dog Club of America was formed in 1985 for the purpose of achieving AKC recognition. The AKC recognized the American Eskimo Dog on July 1, 1995. The American Eskimo was originally bred to be a multi-purpose working dog of the farm. It is an intelligent dog that is agile, has a strong desire to please, is a thinking breed and has excellent herding instincts. Some of the American Eskimo's talents are herding, watchdog, guarding, narcotics detection, agility, competitive obedience and performing tricks. A member of the Spitz family The American Eskimo dog is a Nordic dog with foxlike faces, profuse coats, tails carried up over the back, and small, pricked ears. Called "the dog beautiful" by their admirers ~ the American Eskimo Dog also known as the "Eskie” with their brilliant white coat, sweet expression, and huge, inviting black eyes. o	Super intelligent with a fun personality. o	Lively, friendly with family & friends, but reserved with strangers. o	Considered a “small dog” as they weigh in at betwee 10-30 lbs & make a great companion, family dog. o	Despite their size they have a big dog personality. o	Affectionate, upbeat, with an independent streak and a real problem-solver. o	Eskies excel in obedience competitions, tricks, agility, conformation, and other dog sports. 	*Once a favorite as a circus performer, travelling throughout the United States in the late 19th century entertaining audiences with their amazing abilities. o	.The Eskimo Dog makes an excellent watchdog ~ taking their watchdog duties very seriously, though not known to be aggressive. o	Can be vocal, engaging in barks, yowls, and even mumbles. Many owners claim that their Eskies "talk" to them. o	Great with other dogs, cats, and children. o	Eskies make excellent apartment dogs as long as they are exercised regularly. o	Thrive in Cold Climates. o	Suffer from Separation Anxiety: Not a breed to be left alone for long stretches. 	Toy: 9 – 12”, approx.. 10 pounds. 	Miniatures: 12 -15”, 20 pounds. 	Standard: 15-19: approx.. 30 pounds. American Eskimos of any size are considered very intelligent, alert and active dogs. They are quite capable and willing to defend and guard their family when it's called for. They are generally very good companion dogs for individuals or even full families. They get along swimmingly with children who are well-behaved. Most tend to do very well with company once proper introductions have been given. This breed does have a very high energy level, which can present problems for those who cannot properly exercise their Eskie on a regular basis. It is very important for these dogs to get the love, affection and attention they crave. These dogs thrive on having something to do. When an American Eskimo is left to its own devices for too long, they can become a little noisy and even a bit destructive. When proper exercise is a part of routine, destructive tendencies tend to be kept in check rather well. Despite some precautions, the breed is considered as ideal for city-living as it is country dwelling. Properly training and exercising an American Eskimo will generally prevent any disciplinary problems this breed might present. Since they are typically compact, even in the standard size, they can thrive in small places easily. Although they resist "working," the American Eskimo can be highly trained to perform tricks, stunts or simply just behave. The breed tends to show very well in obedience trials. Individual Eskies might have a stubbon streak, but most can be coaxed into proper training and playing. On the guard dog front, this breed is considered ideal for homes because of its natural wary behavior around strangers. They have been known to refuse entry to those they do not know. Most American Eskimos, however, make fast friends with strangers as soon as their owners properly introduce them. They are quick to bark at people and things outside that do not belong. American Eskimos that are well-trained, well-loved and well-exercised are considered perfect the companions and are even ideal for shows and breeding. They are quite loyal, love attention and will aim to please their owners. They might need firm guidance now and again, but their temperament overall is considered ideal for novice dog owners to handle. They are not overly difficult to train. The American Eskimo is renowned for its rather thick snow-white or cream-colored coat. It is easy to groom, but grooming must be kept up with for this to be so. The Eskie needs to be fully groomed at least twice a week to maintain its appearance and keep its coat free from mats. When it is shedding, a daily brushing is in order. The breed is considered "average" on the shedding scale. It is considered wise to fully comb out or brush an Eskie's coat a minimum of two times a week. Doing this will keep its coat looking beautiful. A coat like the American Eskimo has can easily become tangled and matted if a proper brushing routine isn't established and maintained. Bathe Eskies on an as-needed basis. It is not necessary to bathe these dogs on a regular basis. Wait for them to feel or look like they need it to avoid drying out their skin. Do take care to clean out their ears and remove hair, dirt and any wax build up that is troublesome. It is wise to inspect them closely for fleas and ticks in season and take steps to prevent infestations. Unless American Eskimos are run on hard surfaces frequently, they will require nail care. Their paws should be inspected regularly and nails trimmed as needed. Although they do have a very dense coat, Eskies are not generally considered difficult to groom. Basic, routine maintenance of their coats tends to keep them looking quite beautiful. American Eskimos are chock-full of energy inside and out. They are known for being extremely active dogs and must get adequate exercise on a daily basis. If they are not properly exercised and entertained, this breed is known for being a bit noisy and destructive. Tiring them out with a good exercise routine can help prevent chewed furniture, shoes and so on. It can also help prevent neighbors from complaining about excessive barking. A perfect workout for an Eskie involves at the very least a good, long daily walk. At least 20 to 45 minutes on the leash is not a bad idea each day. This can be broken up into two daily walks to keep energy level under control. If walks are not possible, Eskies can tire themselves out playing in an enclosed back yard. Find a favorite toy, such as a ball, and an owner will get to see just how much energy even the smallest Eskie has. Eskies love to play and run and tend to do very well with both agility and obedience training, which can double as exercise. Eskies are also known for their ability to perform tricks, so some spirited fun might also be in order. If daily exercise routine doesn't seem to be keeping the energy level under control, consider adding more to it. The more active an Eskie is kept, the happier it will be. Just try to keep a routine or schedule in place. This can help greatly when an owner has to be away on a daily basis. American Eskimos are considered incredibly smart, but that doesn't mean they are easy to train. It is suggested that training in basic housebreaking, obedience and agility, if desired, begin as quickly as possible after an Eskie is brought home. These dogs are quite intelligent and they love to please, but not all of them enjoy working. Proper training techniques are a must to coax the reluctant into performing well. Many Eskie owners opt for organized training classes for obedience, agility and showing. These classes can help ensure that proper training techniques are being used. A natural mistrust of strangers is common in this breed, but unbridled aggression is not. Aggression problems can be avoided entirely in most cases, if proper training begins in the puppy stage and is reinforced throughout an Eskie's life. Eskie's sometimes have performance anxiety and do need to be coaxed into training correctly. A gentle, but firm command of the animal is necessary to overcome this problem. When obedience problems are present with this breed, consistent reinforcement of proper behavior is generally the way to go. Eskie's are smart and they can comprehend commands, tricks and behaviors very easily.